Oldham County is in the northwestern corner of the Panhandle, bordered on the west by New Mexico, on the north by Hartley County, on the east by Potter County, and on the south by Deaf Smith County. Vega, the seat of government, is thirty miles west of Amarillo. Oldham County History from the Handbook of Texas Online. When Oldham County was organized in 1880, Tascosa was chosen as the county seat. A few years later the railroad came through the county, missing Tascosa by two miles. In 1915, the county seat was moved to Vega. 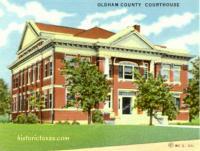 In 1884, Oldham County’s first courthouse, a two-story brick building, was constructed at Tascosa. Today the building serves as the Julian Bivins Museum. In 1915, the county’s second courthouse was built at Vega, at Main Street and US Hwy 385. The original hipped roof was replaced with a flat roof and the building remodelled in 1967.